to the Canary, Dev, and Beta channels. In addition to the usual plethora of bug fixes, there are a number of noteworthy changes just in time for the holidays. 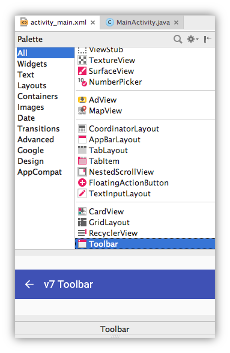 For those in the Beta Channel here are many of the changes since Android Studio 2.2. 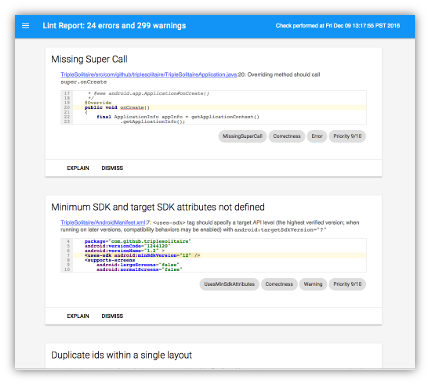 IDE: In Android Studio 2.3 Canary 1 we upgraded the base IDE from IntelliJ 2016.1 to 2016.2, which adds a number of new features -- ligatures, breadcrumbs, editor background images, revamped UI for inspections, notifications and the debugger, and more. In Beta 1 we include a few additional fixes in OpenJDK that should help Mac users running Sierra. Layout Editor. There are several new features in the layout editor. First, the palette has been completely rewritten. The new palette offers previews of the widgets, better sorting, as well as search and filtering: click on the search icon findPlain.png to find a widget. Second, search and filtering now also works in the property inspector. And third, you can now customize the set of properties shown for a given widget type in the inspector. In the all properties table, click on the star icon favorites.pngto favorite the properties you want to see for this type of widget, and from now on these properties will be shown in the Favorites section in the component inspector. Additionally, Since Android Studio 2.3 Canary 1, the layout editor now supports chains and ratios for ConstraintLayout. In Android Studio 2.3 Canary 3 we reworked the internal architecture to improve the performance and reliability, in Beta 1 we included a number of bug fixes and further refinements. We are working hard to offer a solid solution for our stable release. Please continue to file bugs and feedback at b.android.com. Lint. In Android Studio 2.3 Canary 3, the command line HTML reports have been overhauled -- instead of the old dark Holo look, they now have a Material design look, and the included code snippets are syntax highlighted etc. From Android Studio 2.2, lint now has "baseline support" which lets you check in a current set of warnings -- and from now on, only new issues are reported. This lets a project with a lot of technical debt set a baseline and then break the build only when new issues are introduced, without having to go and fix all existing issues first. In order not to forget about the technical debt though it creates an info-level issue which tells you that you've filtered out bugs. Additionally, there are many new lint checks. Some examples include enforcing the new @RestrictTo and @VisibleForTesting(otherwise=intended) annotations in support library 25, flagging obsolete SDK_INT checks, making sure animated properties are valid and not renamed in release builds,flagging potential wifi manager memory leaks, and many more. Dual debugger: In Android Studio 2.3 Canary 3, the Hybrid debugger has been renamed to Dual debugger. Known Issues: In addition to the known issue around build caches, we also found an Instant Run issue when you don't define a version in your build.gradle file the App won't install. A fix is already in place and should be available in Beta 2. You can find a full list of Android Studio 2.3 bug fixes including work that is already underway for Beta 2. As always we value ever bug filed, so please test out our new features and let us know if you run into any problems on b.android.com. We have just released Android Studio 2.3 Beta 1 to the Canary, Dev, and Beta channels. In addition to the usual plethora of bug fixes, there are a number of noteworthy changes just in time for the holidays.